Claudine Gay is the new dean of the Faculty of Arts and Sciences. President Lawrence S. Bacow announced this morning that Claudine Gay—Cowett professor of government and of African and African American studies, and dean of social science within the Faculty of Arts and Sciences (FAS)—will become dean of FAS August 15. She succeeds Michael D. Smith, who announced last March his intention to step down upon the appointment of a successor, concluding 11 years of service that coincided with the presidency of Drew Faust. As dean of social science, Gay has had budgetary and appointment and promotion authority for slightly more than one-third of the FAS (252 faculty members in social sciences, in a total of 730-plus). She has also been directing the new Inequality in America Initiative, launching an interdisciplinary program of particular scholarly and public interest at the present moment. Claudine Gay is an eminent political scientist, an admired teacher and mentor, and an experienced leader with a talent for collaboration and a passion for academic excellence. She is a scholar of uncommon creativity and rigor, with a strong working knowledge of the opportunities and challenges facing the FAS. She radiates a concern for others, and for how what we do here can help improve lives far beyond our walls. I am confident she will lead the FAS with the vitality and the values that characterize universities at their best. She inspires trust. She is broadly curious and eager to engage with new ideas and diverse views. She listens intently and speaks incisively. She relates to people with warmth and ease. She is committed to free expression and robust dialogue across lines of difference and to inclusion as a pillar of Harvard’s strength. She radiates a concern for others—and for how what we do here can help improve lives far beyond our walls. She is someone who elevates every conversation she is part of…. That could well be read as a prospectus for the sort of leaders Bacow intends to appoint generally, and for the characteristics and personal priorities he himself expects to project—a subject explored more fully in Harvard Magazine’s forthcoming portrait of the new president (to be published in the September-October issue and released online in mid August). It is hard to imagine a more exciting opportunity than to learn from and lead the faculty, staff, and students of the FAS. I am reminded daily that ours is an extraordinary community—diverse, ambitious, and deeply committed to teaching and research excellence. We are all drawn here, each in our own way, by a passion for learning, a search for deeper understandings, and a will to serve the common good. I look forward to working together to advance our shared mission, one never more important than it is now. My research interests are in the fields of American political behavior, public opinion, minority politics, and urban and local politics. My research has considered, among other issues, how the election of minority officeholders affects citizens' perceptions of their government and their interest in politics and public affairs; how neighborhood environments shape racial and political attitudes among Black Americans; the roots of competition and cooperation between minority groups, with a particular focus on relations between Black Americans and Latinos; processes of immigrant political incorporation; and the consequences of housing mobility programs for political participation among the poor, drawing on evidence from the Moving To Opportunity demonstration program. Claudine is a thoughtful academic leader who listens generously, delights in the intellectual diversity and energy of our community, and is driven by a deep commitment to our mission of teaching and research excellence and to this institution. She is an inspired choice, and the Faculty of Arts and Sciences is exceedingly fortunate to have her in this role. Citing a quarter-century of engagement with the community, dating to the beginning of her graduate studies, she continued, “The work that we do here is more important than ever” to the United States and the world. She listed challenges such as inequality, immigration, climate change, and diversity—many of them, naturally, with strong roots in the social-sciences fields where she has been academically immersed. She also said that the task force on inclusion and belonging was “a call to action” for the leaders of Harvard’s schools, who must figure out “how to make that vision real” in Harvard’s practices, financial priorities, faculty appointments, and student experiences. As she embarks on her FAS responsibilities—soon, given the limited transition time—Gay said she would draw on what she learned as social-sciences dean; rather than entering with a long agenda, she “prioritized listening,” and would do so now, especially as she familiarizes herself with the parts of FAS she has not worked with in the past. Beyond that, she said, she would be guided by her “value commitments around transparency, equity, and diversity,” while continuing to bring the inequality initiative along, scaling it up, and finding resources to make it sustainable. As for specific challenges facing FAS, she said she was “encouraged by the new vision” for the General Education curriculum, and by the energy its new faculty director, Jason Mitchell, professor of psychology, and the new dean of undergraduate education, Amanda Claybaugh, bring to the task. There is “a fair amount of work to do over the next year,” she said, but she expects a “robust and compelling” curriculum to begin emerging by the fall of 2019. Gay conceded that restraining faculty growth has been “a source of frustration.” But she noted that the faculty’s intellectual renewal has been sustained, in part, by the searches conducted to bring new professors to Harvard to fill openings created by retirements or other departures from Cambridge. As social-science chair, she said, she emphasized “optimizing” every search, and encouraging faculty members to survey their fields constantly, so that when a search is authorized, they are fully prepared to identify, attract, and appoint the most promising new scholarly colleagues. “It works pretty well,” she said. With Gay’s appointment, the University has recently welcomed something of a decanal youth movement. 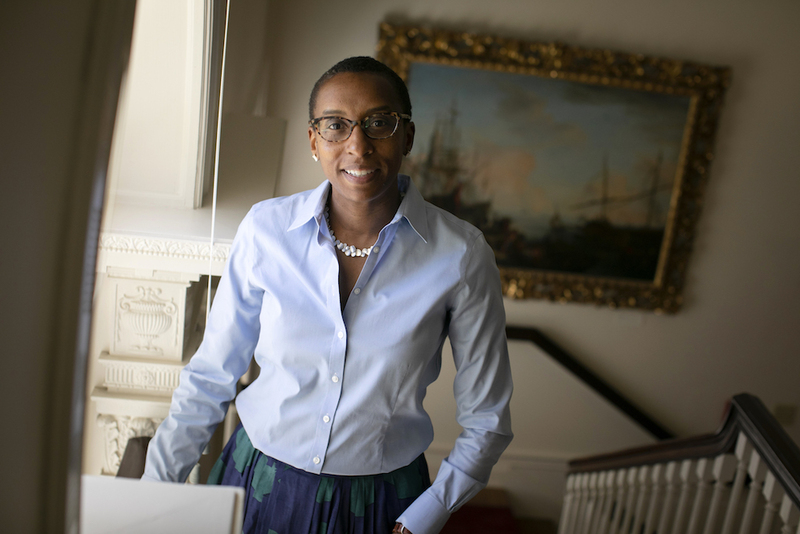 She joins an increasingly diverse group of academic leaders who include Michelle Williams at public health, Bridget Terry Long at education, and Tomiko Brown-Nagin at the Radcliffe Institute. Like Bacow, Gay has a family story to tell. Both her parents were college-educated, she said, but their view of the connection between higher education, for her and her brother, and career plans was “relatively narrow.” Her broader interests, she said, “at best mystified them and at worst worried them greatly,” but with the guidance of wonderful mentors at Stanford, she was able to “embrace the full potential of the liberal arts,” to open up intellectual space for herself, and to pursue an academic career. In her own advising, she said, and particularly for first-generation and immigrant students, she tries to do the same, without recruiting them into any one academic discipline or path. “I was deeply informed by the experience I had” in the academy, Gay said. Her experience as a divisional dean, like Bacow’s prior presidential experience at Tufts, also equips her to plunge into leading FAS with a valuable base of knowledge and contacts, even as her responsibilities broaden significantly. Now, at a moment of heightened public interest in higher education, amid concerns about social opportunity and equity, this scholar of the social sciences will have the broadest possible opportunity to apply the lessons of her academic and managerial experience alongside her Harvard faculty colleagues—and beyond.